I’m not Stephen King. Or Steven Pressfield. I’ve never published a novel. I’ve never had The New Yorker asking me to write a weekly column. There’s literally nothing in my background that would indicate I can give someone valid advice on becoming a writer. I call myself a writer and I know I can write, but right now I am really a blogger. Not that there’s anything wrong with that. But as a blogger, I’ve been wondering why so many of us write about writing. Because it makes us all look bad. Really bad. When bloggers write about writing they don’t write about the technical aspects of becoming a better writer. They write about how to create better headlines. How to gain more followers. How to make $10,000 in one month on a platform. How to become a Top Writer. But none of that is about writing. It’s about marketing. It’s about a short-term plan for getting noticed. And real writers are turning over in the graves saying, “F*ck that sh*t” Because that’s all it is. Sh*t.
All it is a marketing ploy to get more views. To pray on the insecurities of creatives trying to make a name for themselves. And it works. Really well. But it never lasts. And the backlash will be strong when they realize it’s all smoke and mirrors. And that following and unfollowing people every day isn’t the same as reading books about actual writing. While some of us have our heads deep in On Writing or The War of Art, others are paying $299 for an e-course on how to scale their growth on a platform that may not even exist in six months. While some of us keep our heads down and write, others are regurgitating their monthly earnings built behind a deluge of quantity, not quality. And it’s making us look like sh*t.
If you’ve spent any time on a platform like Medium, you’ve seen the ludicrous nature of posts titled, How I Made $117.13 in My First Month and How I Got 500 Followers in My First Week. Answer this: what other business allows complete f*cking novices to do this? And in what other arena do people lap this up as some sort of overriding community narrative? Would you read a story about success based on a week of activity? Or a month? That’s how people lose all their money in the stock market. Buy high, sell low. And when writers plop themselves on a new platform, try to hack the system, and then write about their high points, it devalues the entire system that was built for them. Bobby at the park just hit six jumpers in a row. He tells you that he has a shooting e-course for $149. He’s right there. You see he can shoot. You’re in. Weirdly, he has a Square credit card processor in his pocket. Your friend rolls up to take next with you and you tell him about Bobby. Your friend starts laughing. He tells you that Bobby can only shoot from that one spot. He also tells you he just took the Steph Curry MasterClass on shooting, ball-handling, and scoring. You look over and Bobby still hasn’t moved from that one spot. You decide to give it a week. You meet up next week with your friend so you can see who has learned more about shooting. Bobby’s e-course was all about getting people to follow your new Instagram, ShootingGuru99. Bobby taught you how to follow other shooters and how to get them to follow you back. And once they do, you unfollow them. Your friend was watching a class where the teacher was the best shooter in the history of the NBA. He paid a quarter of what you paid. Bobby is still there. Selling his same bullsh*t. You realized you hadn’t even learned anything about shooting or becoming a better basketball player for your $149. Your friend just dropped 8 buckets in a game to 11. You didn’t get picked up. Because everyone knows that someone who buys in on Bobby doesn’t want to be a better shooter, they just want to be more well known. Congratulations. Now everyone knows you. But your friend has a tryout with a G League team this weekend. But that’s what bloggers writing about writing are. It’s just Bobby. Space your paragraphs better. Add more images. Size your headers better. Add a call-to-action reverting back to your mailing list. Don’t worry about the fact that you can’t actually write worth sh*t. You have 241 followers and you’ve only been on the platform for a week. This is success. It’s also a crock of sh*t and just what we don’t need. We already have social media if we want to sell ourselves as something we aren’t. We really shouldn’t have e-classes on how to do it professionally. But it’s our fragile egos as creatives that gets us to shell out money to people like Bobby. I did it when I first got to Medium in October 2017. I took a class called Medium Mastery because I wanted to learn about the platform quickly. I didn’t want to learn about writing so I was the ideal customer. I was the target audience. But what I soon found out is that I wasn’t interested in gaming the system. Not that it was all that. There were some very smart nuggets of advice buried inside what was generally a course on how to package yourself and not how to be a better writer. But that’s all there was - nuggets. I put the best parts to good use, but I cracked back immediately. The advice to follow and unfollow people was an abomination to me because it was building a following under false pretenses. The obsessions of headlines was also an issue for me. People were spending as much time on their headlines as their writing. And this is it again. Bloggers writing about writing. A lot of people eat this up. And they become a disciple of this type of growth mindset on a writing platform. But all that does is ruin what real writers are doing there. Because a real writer doesn’t title something, 5 Ways To Achieve Anything, Backed By Science. Scientists everywhere just vomited in their mouths. This is the problem. It’s tantalizing to a new blogger. I can make money. I can make it onto the Medium homepage. I can do this all as a single mom. But these aren’t a blueprint. These are anomalies. Some better than others at what they do, but none of this is about writing. It’s about blogging. And there is nothing at all wrong with making a decision that this is the way you are going to make money. But you can’t also think that this is helping people. You can’t also think this is important. And the biggest hypocrisy of all is that many of these type of stories are locked behind the paywall. Read my story about how I made $10,000 this month and also pay me more money while you do it. Read about how I made $2,000 from my blog in 24 hours and while you are reading about it, make me some more scratch so I can then write a story about how I wrote this story about writing a story. And then I will put that behind the paywall too. I’ve written stories on Medium about my journey too, but they were philosophical endeavors about what each cyber milestone meant. The Winding Road to 1,000 Followers has 354 fans, but it’s not about making money. What My First Year on Medium Taught Me only has 34 fans. It’s because the viewing audience wants what’s in that image more. They want a quick fix to get to 1,000 followers or a hack to make $1,275 on Medium in a week. But that’s not doing them any favors. They still can’t write. And the more we promulgate this philosophy of bloggers writing about writing, the more the platform becomes a cesspool full of group excrement. Who the f*ck are we to be writing this stuff? No book deals. No syndicated newspaper columns. Nothing except a monthly payout on a website. And we are cannibalizing the very group of independent writers we should be working to help. This isn’t help. It’s convincing everyone they can do this too, if they just do X. Or Y. But algorithms don’t play like that. It doesn’t even matter if the content inside these clickholes is helpful because the overwhelming directive is: you can make this money too. But they can’t. Some can, but most can’t. 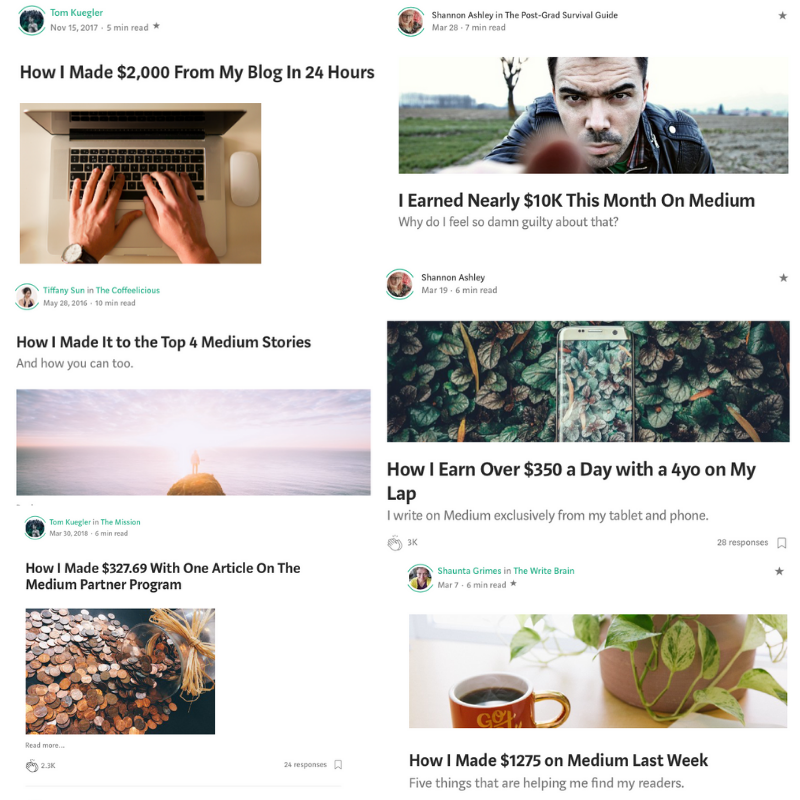 Only 10% of all writers on Medium make over $100 in any given month. And that stat has never been verified. You really think 3k claps of people are suddenly going to make $350/day with their kid on their lap. This isn’t writing. Just call yourself a marketer. Or a content creator. But don’t honestly tell yourself that someone is riding up with a book deal or a New York Times column for you based on this drivel. But you can’t say that. Because then no one would read this sh*t. Because they want to be writers. And they think this is the way. Because you told them so. The one thing I’ve always found at the top of the ridiculous ladder is this: how can some writers continuously write about how poor they are and how much they’ve struggled and then follow that up with a piece about how much money they just made? Don’t they know that there are others still struggling who will now hate them, not revere them for hacking a system by posting five times a day. When bloggers write about writing they make all of us independent writers less valuable. When Medium makes at least fifty percent of its subscription base from content about coding, startups and Silicon Valley, we are only writing to the other fifty percent. If it’s even that much. And now on our half of the pie we are manspreading all over the place with diatribes about our monthly income and how we do what we do. What about writing something that matters? Not about earning just enough to get by. Or enough for one dinner. Something that f*cking matters! If I am criticizing you, I am criticizing me too. I’ve felt all of that. I’ve done all of that (not really) or at least thought about whether or not it would be worth it. But in the end, where is it getting anyone? Random House isn’t publishing books about How to Become a Top Writer on a Website in 11 Easy Steps. They think that’s bullsh*t. And your poetry isn’t going to turn them around once they’ve seen that sh*t.
Bloggers should just blog. Because until we’ve published something, somewhere that doesn’t exist on a computer screen, that’s all we are - bloggers. If we want to be writers, we have to do better. I have to do better. You have to do better. They have to do better. Stop telling me how to blitzscale my profile. And gain followers. And make money. I’m busy right now. I’m actually writing. I’m not selling a lie. Or playing on the creative ego. I’m just writing. Actually, if I take my own commentary. I’m blogging. And I know this. One day you will too. Or you will cut the sh*t and become a writer.